THE DAILY GROTTO: POPE BENEDICT'S VISIT TO THE U.S.
FOR URGENT PRAYERS FOR MELISSA GO HERE. 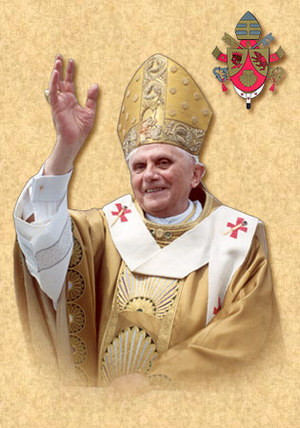 Today is Pope Benedict XVI's 81st Birthday. We love you Holy Father! Thank you for coming to the United States for a much needed visit. Most people who celebrate their 81st birthday are doing so in retirement or in a much more relaxed lifestyle. Not this Pope. 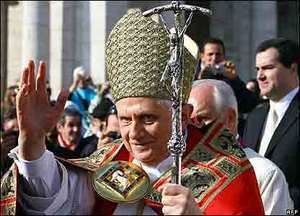 God has granted him special graces in his advanced age to minister to the Catholic Church as a loving shepard. Traveling to America can't be an easy trip for the Holy Father yet he is here, and will be delivering some difficult; but encouraging messages to the people in our country. If you haven't done so already; how about it if we all offer up some special prayers for the Holy Father today for his birthday and for his papal mission in the U.S. this week. I am very enthusiastic about the upcoming Papal visit to the U.S. I will not physically be in Washington or New York; but I will be there in spirit, and plan to watch the live coverage as much as possible. How about you? What are your plans for keeping abreast of the Pope's visit to America? The following is an excerpt of the text written by Pope Benedict XVI. For a more complete version go to Zenit. The grace and peace of God our Father and the Lord Jesus Christ be with all of you! In just a few days from now, I shall begin my apostolic visit to your beloved country. Before setting off, I would like to offer you a heartfelt greeting and an invitation to prayer. As you know, I shall only be able to visit two cities: Washington and New York. The intention behind my visit, though, is to reach out spiritually to all Catholics in the United States. At the same time, I earnestly hope that my presence among you will be seen as a fraternal gesture towards every ecclesial community, and a sign of friendship for members of other religious traditions and all men and women of good will. The risen Lord entrusted the Apostles and the Church with his Gospel of love and peace, and his intention in doing so was that the message should be passed on to all peoples."